DEBT is money owed to another person or organization. A person who borrows money is a debtor. A person who loans money is a creditor. Debt lets people make purchases now instead of later; however, debt must be repaid with interest. 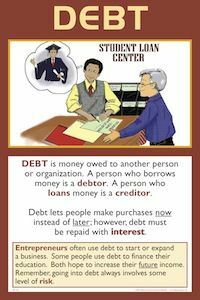 Entrepreneurs often use debt to start or expand a business. Some people use debt to finance their education. Both hope to increase their future income. Remember, going into debt always involves some level of risk. Most students have a basic understanding of what debt is. Probably the key idea to get across to students is that debt must be repaid, usually with interest. Debt tends to have a negative connotation, probably because too much debt can be a real burden. However, prudent debt that is managed carefully can be helpful, especially for large items such as a house, a car, or education. Entrepreneurs often take out loans to start or expand a business, which entails some risk, but also the potential of great reward if the business is successful. The most burdensome debt is probably credit card debt. People with excessive credit card debt end up paying large amounts of interest on their balances. For example, the Interest Posters illustrate that a person with a $3,000 balance on a card with a 19.8% interest rate who pays the minimum amount each month will end up paying over $9,000 in interest, and it will take over 32 years to pay off the balance! Students should also understand that the interest paid on debt is directly related to risk. A creditor (lender) will demand a higher rate of interest if the loan to a debtor is considered risky, and vice versa. Collateral is security or guarantee (usually an asset) pledged for the repayment of a loan if one cannot secure enough funds to repay. Lenders often will not make loans unless there is some form of collateral. Students can also apply the concept of opportunity cost to the decision to incur debt. The opportunity cost is represented in part by the interest that is paid – money paid for interest cannot be used to purchase other things. Also, when one incurs debt, it is for higher satisfaction now, but the opportunity cost is less satisfaction in the future, if income is unchanged. Have students use web or other resources to study credit card debt. They should describe differences in credit cards, such as interest rates, benefits attached to cards (e.g. points, plane miles), credit limits, fees, etc. The ABCs of Credit Card Finance is good. Have students conduct a “Is Debt Helpful or Harmful?” survey with friends, neighbors, and family members. Students should first create the survey, then compile results and write a short report on survey results. The report should include graphs. Interview an entrepreneur. Ask if he or she had to incur debt to start or expand the business. Ask these questions: Who lent you the money? What was the interest rate? How long was the debt for? Did you have to put up any collateral? Was it a burden? Do you still owe on the debt? Was taking on this debt a success? Would you take on this debt again?